In the spring of 2012, Bel Mondo Beauty set out to transform a common skin care product – facial sheet masks – into an exceptional one. We became the first US brand to develop and market masks made exclusively from an advanced fiber called bio cellulose. Shortly after our launch, skin care professionals began adding Bel Mondo’s distinctive treatment masks to a variety of their services. They valued the therapeutic benefits of bio cellulose: its capacity to hydrate and soothe skin was unequaled. And they loved Bel Mondo’s eco-friendly approach. Our biodegradable mask fabrics, free of toxins and parabens, were ultra-safe for their clients and kinder to nature. 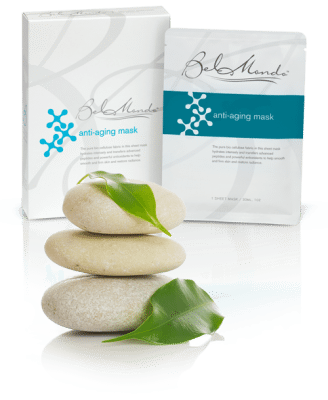 Today, Bel Mondo’s professional-quality mask line is the choice of estheticians in hundreds of the finest spas, medical spas, and resorts in the USA. We’re proud to have earned their trust. Along the way, discerning consumers have discovered our niche brand, too. When there is no time for a spa visit, they know that a pampering session at home with a Bel Mondo facial mask is the absolute next best way to get a healthy, radiant complexion. Our emphasis on product quality and our belief in the special properties of bio cellulose is as strong today as it was when we entered the marketplace. We make skin care’s best facial treatment masks. Your skin deserves nothing less. Your clients deserve skin care’s best pure bio cellulose facial treatment sheet masks.